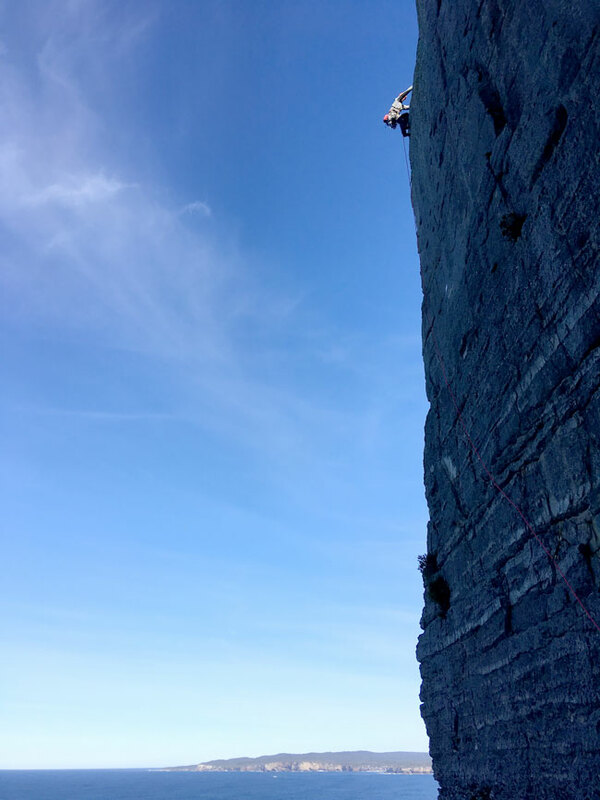 The author belayed by Chelsea Brunckhorst on Centurion (15), Point Perpendicular. Photo: Nina Scott-Bohanna. On my first attempt to climb at Point Perpendicular, I got as far as the Lighthouse carpark. Upon arriving with my friend Jarrod, the excitement was high. Unfortunately, the weather was also excited – so excited, in fact, that it wet itself... all day. My second attempt went a little better. For starters, we actually got out of the car. We even got as far as putting on harnesses, racking up and setting up our abseil rope. But when we attempted to throw the abseil rope over the edge, the wind was so strong that it flung the rope back over our heads. 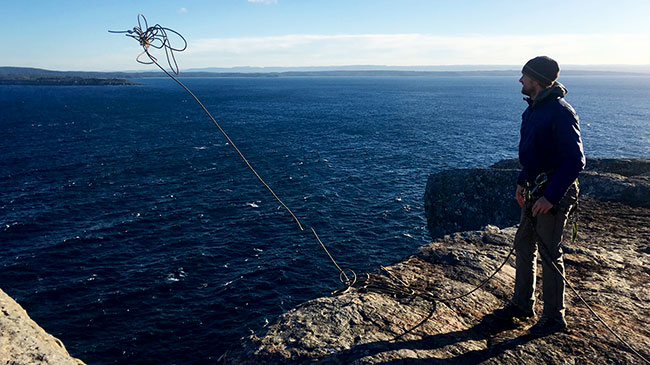 The full 50-metre rope was swept into the scrub behind us. We took this as a sign that it was too windy to climb that day. The abseil rope hovers in mid-air. Photo: Nina Scott-Bohanna. On my third attempt, I didn’t even make it past the entry gate. The road was closed (even though we had been told the day before that the road would be open). You see, one additional complication when it comes to climbing at Point Perpendicular is the access. Much of the peninsula is a navy bombing range, called Beecroft Weapons Range. Because of this, there's no access to large sections of the peninsula (think unexploded bombs!). This means, for climbers, that the access road to the climbing is often closed (regardless of whether or not the range is being used). So, when is it open? The road is almost always open during NSW school holidays, and is also open most weekends. The rest of the time, it's often closed. So, it's a good idea to bear this in mind if you're planning a trip to Point Perpendicular and you live far away. I live in Melbourne, yet despite my three failed attempts to climb at Point Perpendicular, I've salvaged my trip by climbing at other crags nearby. 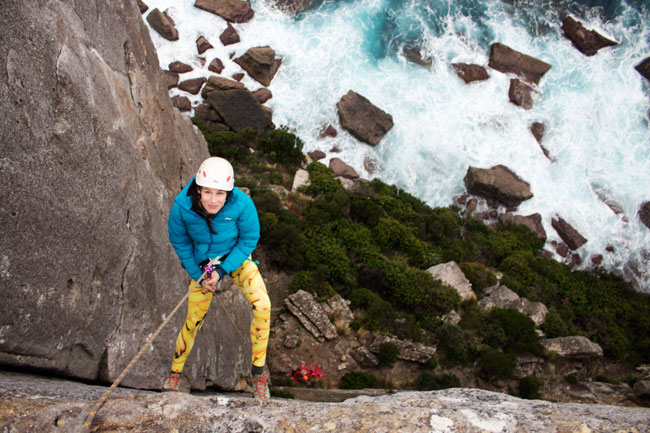 The sport climbing Mecca Nowra is only 45 minutes away from Point Perp, luckily. So, it was with great excitement that in June/July this year, a plan was hatched to head up to Point Perp with my wife Nina and our good friends Mac and Chelsea Brunckhorst and their daughter Erica. A beach house was booked, the car was packed and 10+ hours of driving later (via one of the most vile hotel rooms imaginable – a story for another time), we arrived. Point Perpendicular is Jervis Bay's northern headland and in itself is a striking natural feature. At the end of a lovely drive through coastal heathland, it also features a delightful, historic lighthouse and associated buildings. 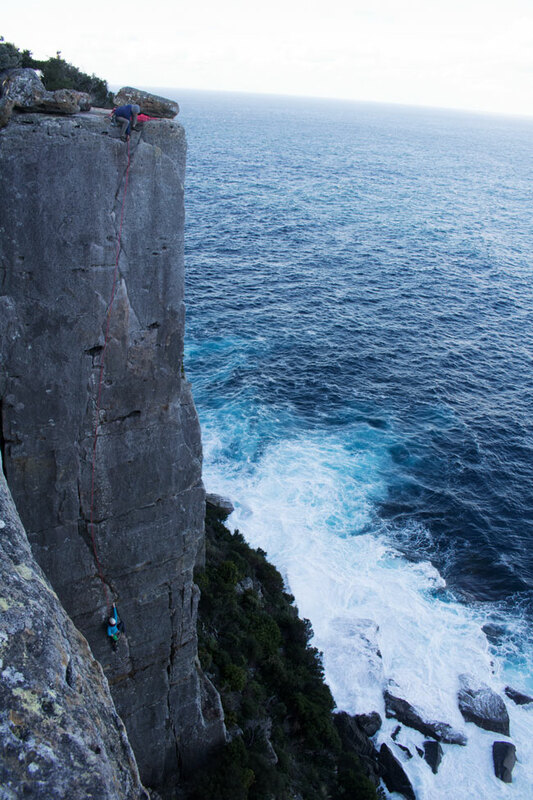 Located a two-hour drive south of Sydney (or 45 minutes from Nowra), it offers some of the best seacliff climbing in Australia. Nina Scott-Bohanna belayed by the author, on Grey Mist (17). Photo: Chelsea Brunckhorst. The rock type is a generally solid sandstone with vertical face climbing, cracks and corner climbing the predominant styles. 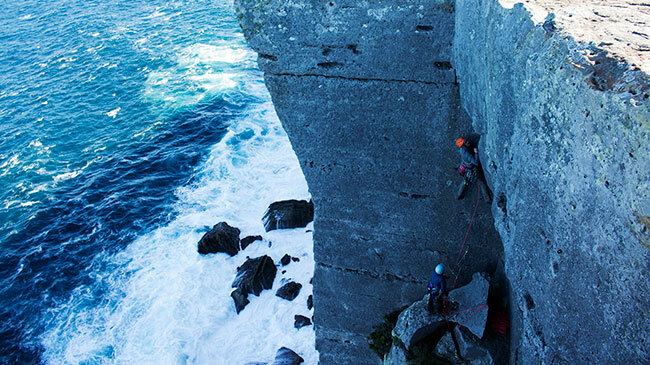 Being a seacliff, almost all the climbs are accessed from above, via abseiling into various ledge systems and then climbing back out. This means that you either have to be confident about getting to the top of your chosen climb, or be prepared to jumar back up your rap line if you can’t do the climb. 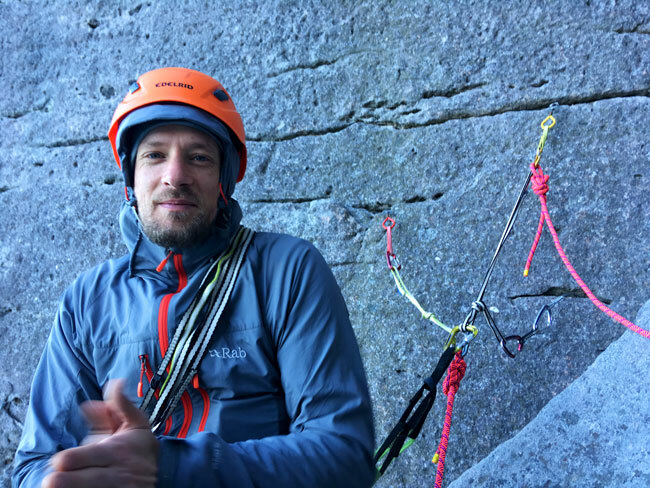 Due to this access method, the lack of many friendly, lower graded climbs and the inherently scary nature of seacliff climbing, this is not a great place for beginner climbers. However, for competent climbers who are ready for the challenge, Point Perp provides an ideal location for some of the most unforgettable climbs one can experience. For many years Point Perp suffered from a common climbing area ailment that I like to call bad guidebook syndrome. 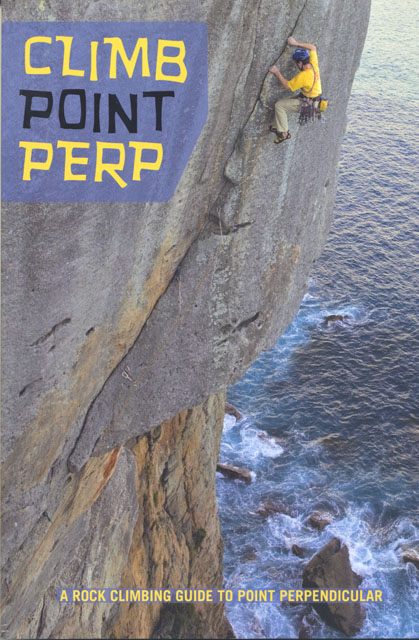 Luckily, in 2011, Robert Dun released a new guide called Climb Point Perp, which was a huge advance on the old guide and is one of the better guides I have ever used. For an area with complicated access and tricky route finding, it was very well received by the climbing community. So much so, it caused a flood of route development at the cliff. Since then, Point Perp – once a bit of a backwater climbing area – has turned into a quite popular area, like it deserves to be. This new development has filled in many of the blanks on the cliff, often with the addition of bolts. Bolts have always been used at the Point and it now has many fully bolted routes. However, it is not a sport climbing area – trad climbing gear and skills are requirement. So, it was on my fourth attempt to climb at Point Perp that I finally got to put finger to stone. And it was everything I hoped it would be and more. Given that we were there in winter, one factor we had to pay special attention to while climbing at Point Perp was the wind. Depending on the direction and intensity, it dictated whether or not we could climb that day, and also how comfortable our day at the crag would be. Our first day was quite windy. Interestingly, it wasn’t too bad at the top of the cliff, but it was terrible at the edge of and further down the cliff. As the days progressed and wind died down, we got more climbs done and enjoyed the crag a whole lot more. Mac Brunckhorst follows the author up the mega-classic Northern Exposure (22). Photo: Nina Scott-Bohanna. One of the great things about visiting a new cliff for the first time is that you get to climb all the mega-classic routes. And Point Perp has more than its fair share. Every day, we did a three-star route. The standout route of the trip for me was Northern Exposure. 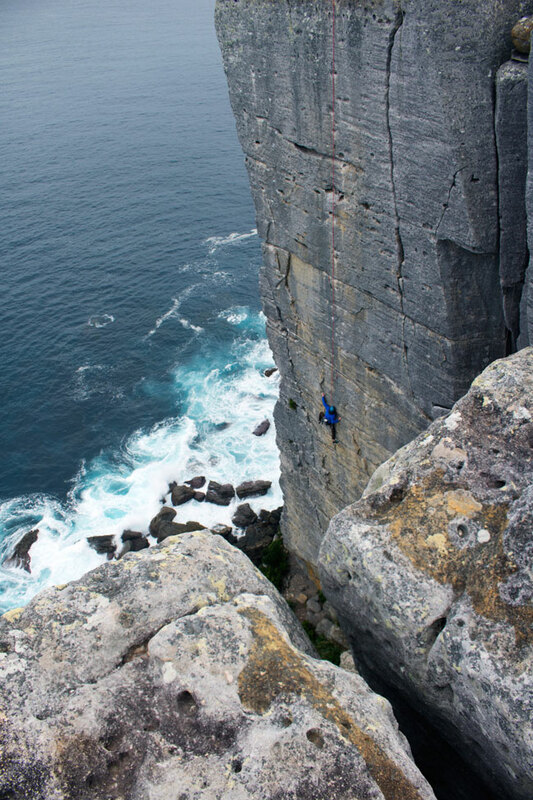 At the Lighthouse Area, it's a 30-metre grade 22 perfectly vertical face climb. I saw a photo of this route many years ago. At the time, it was well above my ability. But I swore to myself that one day I would climb it. Sometimes, when you have a route in your mind for a long time, it can let you down. But not Northern Exposure. It was awesome. The last seven metres was particularly fantastic, with beautiful pockets requiring finesse and power in equal measure. Another stand out was Grey Mist (17), another three-star route that is one of those climbs that had me giggling with joy all the way up. I didn’t want it to end. During this trip, I didn't jump on any climbs that were truly difficult for me. But, I did find the environment quite subtly intimidating. I’m not a climber who scares easily, yet I found myself over-gripping quite a bit over our first few days, while I adjusted to the area. I have climbed at a few different seacliffs around the world, and I do find them to be quite intimidating locations to climb. One massive advantage Point Perp has over every other seacliff I’ve ever climbed at is the fact that most of the climbing starts on ledges well above the waterline. That means you don’t have to deal with tides or swell. This aspect made me happy, having once been soaked to the eyeballs in the UK by a rogue wave. To me, what makes a good climbing area great is not necessarily simply the climbing. It's a combination of the climbing and the surrounds. Point Perp is one of the most beautiful climbing areas I have ever been to. Sitting on top of the cliff, looking out over the ocean with the crashing waves beneath you is a special feeling. And, if you're lucky enough to be there at the right time of year (like we were), you'll also spy whales breaching in the water below. Over our five days of climbing, we saw about 20 whales, plus a few playful seals. Needless to say, we're already planning another trip. 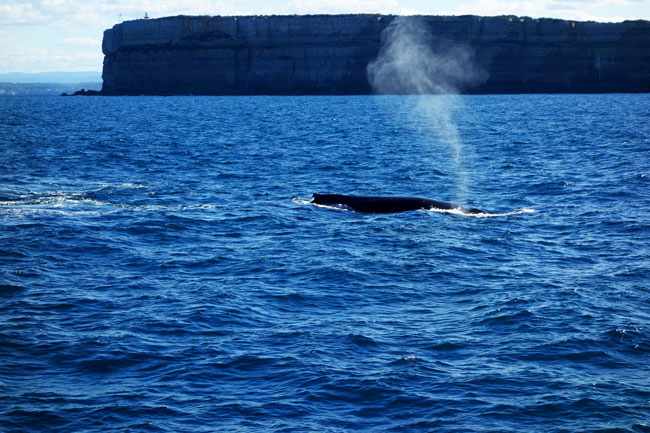 Whales are a common sight in July (Point Perpendicular's cliffs and lighthouse are in the background). Photo: Chelsea Brunckhorst. James, before he remembered to stuff a handwarmer in his chalkbag. Photo: Chelsea Brunckhorst. The author tops out the hanging arête climb Little Red Riding Hood (17). Photo: Chelsea Brunckhorst. Nina raps into the Grey Mist Area. Photo: Mac Brunckhorst.